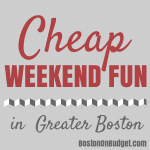 Cheap Weekend Fun in Boston for August 16-17, 2014! Happy (almost) weekend! This weekend is tax-free weekend in Massachusetts so the majority of items purchased are tax free. However, don’t forget that is a 6.25% discount, so not everything is a great deal. 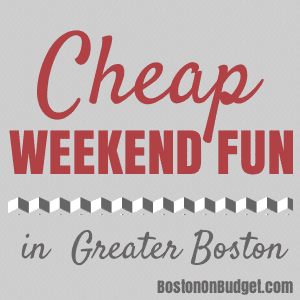 There’s a lot of fun and cheap things happening this weekend in Boston, so feel free to leave a comment if I missed anything! Fisherman’s Feast: August 14-17, 2014 in Boston’s North End. Join this annual feast in Boston since 1910 with a grand procession, music, vendors and much more! Free. GreenFest: August 15-17, 2014 at City Hall Plaza. GreenFest is a three-day festival that showcases earth-friendly and healthy products. There are plenty of performances, children’s activities, foods, and much more! Eastie Pride Day: Saturday, August 16, 2014 at Piers Park in East Boston. Enjoy free performances, food, children’s characters, and much more! Free. August Moon Festival: Sunday, August 17, 2014 on Hancock Street in Quincy Center. Enjoy a lion dance, food trucks, vendors, and much more for the August Moon Festival. Salem Jazz and Soul Festival: August 16-17, 2014 from 11am to 7:15pm at Salem Willows in Salem, MA. Enjoy this 8th annual jazz and soul festival with free music, an artisan’s fair, a kid’s tent, and more! Free. Magic Family Film Festival: Saturday, August 16, 2014 at the Prudential Center courtyard at dusk. Enjoy a free outdoor movie screening every Saturday night at dusk. This week’s free outdoor movie is The Lego Movie! Sylvester Baxter Riverfront Park Movie Series: Every Saturday night in August at Dusk along the Mystic River at Assembly Row. Head to Somerville for a free movie along the mystic river. This week’s free outdoor movie is Beetlejuice! Free Movie Nights at Christopher Columbus Park: Sunday, August 17, 2014 at Christopher Columbus Park at dusk. Enjoy a free outdoor movie at Christopher Columbus Park in the north end at dusk. This week’s free outdoor movie is Happy Feet! Don’t forget that Dine Out Boston kicks off this Sunday for two weekends if you want to try out a new restaurants or dine out at a favorite!